Late last week, I was selected to serve on the House Game and Fisheries, Gaming Oversight, Tourism and Recreational Development, and Urban Affairs committees for the 2019-20 Legislative Session. Just as three of my four committee assignments remain the same, my legislative agenda will continue to revolve around working even harder to serve my bosses in the 49th Legislative District, attacking problems and putting people first. Again, there is a lot of heavy lifting that needs to be done at the legislative level to ensure that our state and local economies thrive, the Mon Valley’s ever-increasing drug epidemic is addressed, our region’s travel and tourism are revitalized, and all levels of government are held accountable. Reviewing all legislation regulating hunters, anglers and boaters, balancing the interests of residents and the importance of wildlife to the state in matters such as Sunday hunting, and determining fees and costs for licensing are just some of the major areas considered by the House Game and Fisheries Committee. In early February, both the Game Commission and the Fish and Boat Commission will come before the committee to issue and discuss annual reports and legislation impacting both commissions. 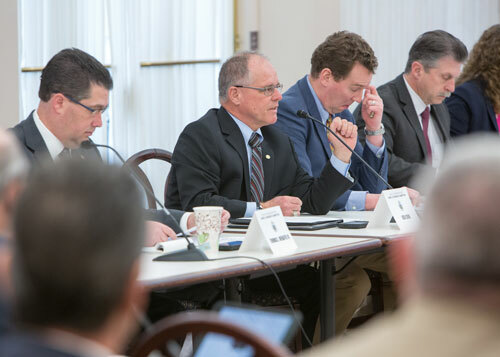 The House Gaming Oversight Committee maintains legislative oversight on matters involving the Pennsylvania Gaming Control Board and Pennsylvania’s casinos and gambling industry. The House Tourism and Recreational Development Committee considers issues including travel and tourism promotion; the Pennsylvania Historical and Museum Commission; scenic roadways; snowmobile and trail-related initiatives; amusement parks, fairs, carnivals and folk festivals; agritourism; hotel and lodging issues; recreational use of land and water; PA Wilds; and many others. My new committee assignment is the House Urban Affairs Committee which reviews legislation affecting Pennsylvania cities including housing; urban redevelopment; economic development; land use planning and zoning; growth management; infrastructure financing; and city services such as police, fire, sewage and water. For the latest district event information and state government updates, visit RepBudCook.com and Facebook.com/RepBudCook. To report a possible dangerous or violent situation, individuals can call the state tip line at 844-723-2729. Tips can also be reported to saysomething.org or through the Safe2Say app on iPhone and Android devices.